Welcome to my first update for the FINISHING SCHOOL READ-ALONG, hosted by Dena @ Batch of Books and I (Tressa @ Wishful Endings)! There is still plenty of time to join if you haven't done so yet. You can go to the official sign-up here and the launch post, which includes an author interview and a giveaway here. You don't need to be a blogger to join, you just need someplace online that's public to post updates for the linky or just participate by leaving your thoughts and updates in response to Dena's and mine. 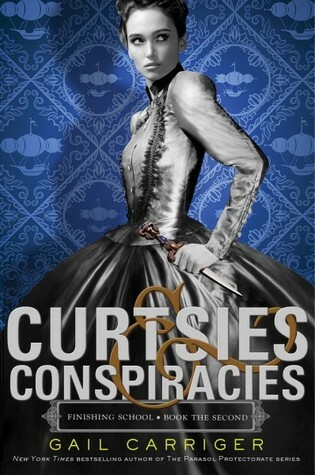 In this sequel to New York Times bestselling Etiquette & Espionage, class is back in session with more petticoats and poison, tea trays and treason. Gail's distinctive voice, signature humor, and lush steampunk setting are sure to be the height of fashion this season. Thoughts on the first chapter and how the author carries over the story from the first book. I love how each of the girls are so different in their own ways, which makes their voices easy to differentiate. Monique and Preshea are just as stuck up as ever and up to mostly no good. Then you have Pillover and Vieve who are so unique and add to the story (love Vieve!!!). There are the boys: Soap, Felix, and others that play a role here and there. I love both Soap and Felix so far and for different reasons. Then there are Sophronia's closest friends: Dimity, Agatha, and Sidheag. I love them all for different reasons as well. So far it is mysterious and intriguing while also being intelligent and humorous in parts. This is what this author does so well. The story is so balanced and so fun while also having an undercurrent of danger and seriousness to it. There is seriously something building and I'm still blind as to what exactly is going to happen. Least favorite part so far, if there is one. I don't really have a least favorite part, but I did get a little upset with Sophronia's friends in the first half of the book. You'd have to read it to find out why. Most favorite part so far. Hmm. It would probably be all the banter between Sophronia and Felix. I also loved when Sophronia had to defend Dimity and herself and Felix saves the day and the ensuing scene. Any predictions for the second half of the book? I think Sophronia is going to be more torn between Felix and Soap and I also think they will both continue to play a role in the story. I also think something is going on with the Professor Shrimpdittle and Professor Braithwope and the vampires. I however, do not know what exactly that is and who exactly will play the villain this time around. I also know that if Sophronia and her friends live up to what I know, they will be getting into quite a pickle, but save the day in the end. I just had to mention that I just love the slang and the names for things and people. Take, for example, Lord Dingleproops. Lol! I also love the name Bumbersnoots, which is Sophronia's mechanimal. I love the role he has played so far in this story. - Who are the Picklemen and flywaymen again exactly? I know they were after Sophronia and her friends for the prototype in the first book, but I can't remember much else about them. - I'd like to ask Gail a few things about the test from the first chapter. - Are all the professors going to be suspect at one point or another? Now it's your turn. If you're reading with us, what did you think? Do you have any questions for the author? She'll be stopping by again later on in the read-along.